It seems the Kriseman administration is having a little trouble multitasking. While the Rays stadium search deal is on the front burner it looks like the Pier issue may not even be in the kitchen. Looking at this week's meeting schedule there are no meetings scheduled for the Pier Selection Committee, nor any public discussion of the current Pier ranking process. All of this procrastination on the Kriseman administration's part and relative silence on the Mayor's part is fueling a series of responses from all sides. New petitions are starting to develop for a referendum, Ryan Mitchell has launched an on line petition, Build Blue Pier, to get Blue Pier, already rejected by the Selection Committee, back into consideration and look for other rejected contenders to start doing the same thing. All of this mostly because the Mayor's handpicked Selection Committee Chairman, Mike Connors, kind of blew the whole process up in literally the 11th hour creating a no decision from the Selection Committee and throwing the whole process into chaos. 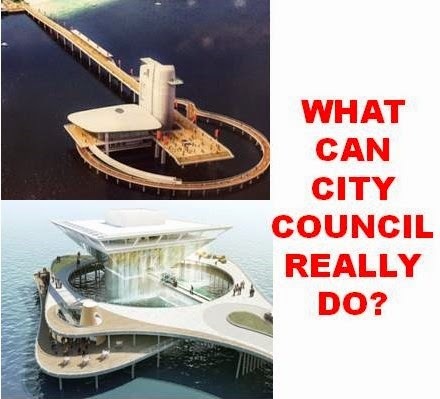 Up to now the Mayor has been speaking about the Pier though his two spokespeople, Ben Kirby and Kevin King both who have total of about 14 months in St. Pete Government experience. Not too comforting. It's time for the Mayor to make a personal statement on the record and get the Pier process back on track. Replace the Chairperson though I am not sure who would want the job, disband the Selection Committee and dump the whole mess in City Council's lap or least popular, declare a screw up and start the process all over. The apparent choice of the administration, ALMA (AKA The Big Banjo), is in big trouble and this delay seems to me to be a typical effort to find a way to put some lipstick on a very unpopular pig. I know the Mayor thinks baseball is the end all be all, but I suspect the Pier will be here long after the Rays have moved on. It's time for some sound comments from the Mayor on the Pier so everyone including those who have invested time and resources into making these proposals know what the next steps are going to be. 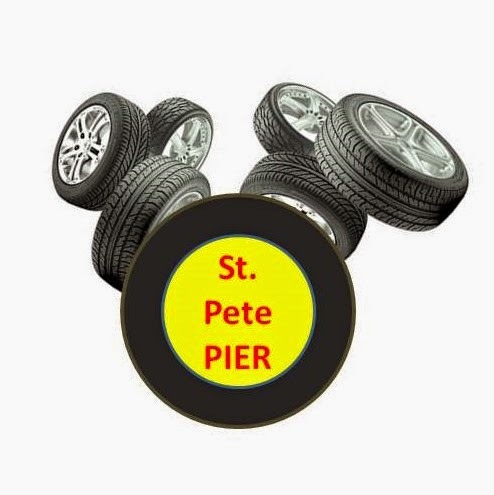 You may or may not remember from the days of the LENS debacle our two intrepid truckers from St. Petersburg, Elroy and Cletus, along with some of their friends, had a lot to say about the LENS and the Pier. Well - their back weighing in on the ALMA and the whole Pier issue. Elroy had just cleared Atlanta heading down to St. Pete with a trailer load of dog food for one of the local pet store chains. He eased the big Cat powered Kenworth up to 70 and smiled as the diesel purred. A quick check of all the gauges, everything fine he punched up a classical music station on the HD stereo. After few minutes of quiet reverie with a movement from Beethoven, the CB crackled to life, "Elroy, Elroy, this here's Cletus got your ears on?" "Hey Cletus what's up," Elroy replied? "You been following the Pier mess," Cletus asked? "What a mess, I thought they were going to rank three finalists on Friday," Elroy replied. "Ya... well, I had a layover so I watched the whole thing on TV. Kind of a cross between watching paint dry and getting a tooth pulled with no Novocain." "The Committee jawed for almost twelve hours and couldn't make a decision, then that guy Mike Connors blew the whole thing up trashing the pyramid and started pushing the ALMA design," Cletus replied. "Have you noticed that thing kind of looks like a banjo when you look at from the land side?" "What," Elroy replied, "A banjo?" Cletus must be losing it Elroy thought. "Ya... just take a closer look at one of those overhead shots from the land side it looks like a banjo," Cletus said. 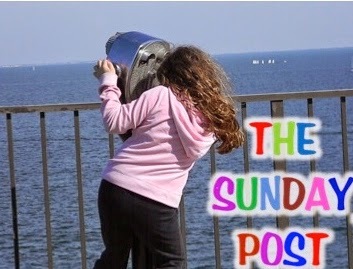 "Plus, that box out on the end is just a box. You can lay the thing on its side or on its back and it's still just a box. At least the inverted pyramid has some personality." Elroy reached across the seat and grabbed a news paper article on the Pier. He looked carefully and sure enough with a just a little imagination it did look like a banjo. Elroy smiled as he squeezed the CB push to talk button, "The Big Banjo, he chuckled, looks like we got the new name." "Should make for some really interesting T shirts." "You know that thing was my last choice on the survey." "Mine too," Cletus replied. "As far as I can tell it was almost everyone's last choice except Mike Connors and his goofy Committee." "People are so upset thee is already a petition drive getting under way." "You would think by now they would have figured this Pier thing out," Elroy replied. "Well, obviously not so much," Cletus replied. "Catch you on the flip side." Elroy turned the stereo up and the thought crossed his mind, "When the people indicate their preference how can you screw that up?" The Alma project puts its major restaurant structure on the uplands. This core choice has direct operational benefits. 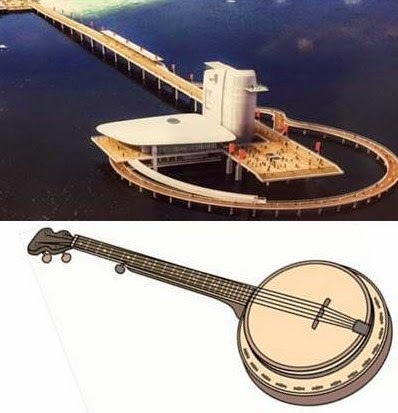 The Alma pier solution is a thousand foot long skinny pedestrian pier terminating at a 150 foot high, narrow observation tower featuring a snack bar and a small ballroom. As for the tower, beauty is in the eyes of the beholder. The Alma pier is a reminder that you get what you pay for, rarely much more.